Light has always been linked to sleep patterns and how it affects your circadian rhythm. Often referred to as your circadian clock or “internal clock,” your brain cycles through sleepiness and alertness throughout the day at regular intervals. Typically, these cycles mimic a clock and changed based on the time of day. The rising and setting of the sun largely influence your circadian rhythm, based on the level of sunlight that reaches your eyes. This triggers a hormone to be released called melatonin. Your melatonin levels are regulated by your pineal gland which operates based on the circadian rhythm of your body. So as sunlight fades, the production of melatonin in your body increases. Your melatonin levels peak in the middle of the night while you are sleep and they begin to fall as morning approaches. Research has shown that bright light, especially blue light emitted from electronic devices, delays the production of melatonin. It has been said that this artificial light, or “blue light” mimics sunlight and can affect your sleep cycle if exposed before bedtime. Sunlight or blue light triggers the brain to delay the production of melatonin until later, as your body associates the light with daylight. 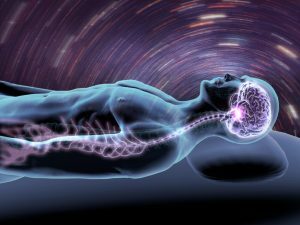 This can offset your sleep patterns and can rouse your body to an alert state, as the pineal gland will be delayed in producing melatonin. One way to avoid disturbing sleep patterns and circadian cycles is to avoid bright light before bed. Turning off electronics and retreating to a darker environment later in the day can naturally prepare your body for a relaxed, sleep-like state. This not only prepares your body for sleep but it encourages overall wellness. Having a healthy sleep cycle can boost your mood and even keep your immune system stronger. One way to ensure that harmful blue light is blocked from reaching your eyes is to wear a pair of sleep glasses prior to getting ready for bed. Blue-blocking glasses, also known as sleep glasses, inhibits blue light from entering your eyes and stimulating your body. These blue-blocking products help aid the sleep process and make certain that melatonin production is not delayed whatsoever to encourage healthy, natural sleep. These amber-tinted glasses and blue light filters block up to 99% of blue light. Using these blue blocking filters about two hours or so before bed can drastically increase melatonin production and keep your body regulated. Studies have shown that while the body is extremely sensitive to blue light, it affects younger children even more so. Whether it be their hormones or the younger eye lenses being more sensitive, the research shows that the effects on melatonin are much more severe. Also, with children requiring more sleep than adults, it is much easier to alter their sleep schedules and offset circadian rhythms. This can have a greater impact on a child’s over health. If you are looking to get your child a pair of sleep glasses to help fight melatonin suppression, consider shopping with LowBlueLights. Our glasses keep your kids on a healthy sleep schedule and protects their sensitive eyes to harmful blue light. Our children’s blue light glasses can easily be incorporated into your nighttime routine and easily allows your kids to still do their favorite activities before getting ready for bed. 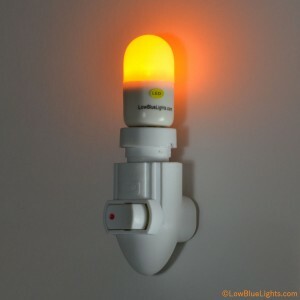 In addition to our blue-blocking glasses for children, LowBlueLights has a wide variety of amber light bulbs, as well as an amber nightlight for your child’s room. There are a variety of flashlights and other amber lighting accessories that can help block blue light in your home. This is especially helpful if you are having difficulty keeping blue blocking glasses on your kids. Our amber light bulbs block blue light that influence your children and hinder a healthy production of melatonin. Melatonin also contains health benefits, along with your natural immunities. An antioxidant itself, melatonin has been linked to fighting off sickness and preventing cell damage to help keep your body strong and healthy. Getting enough rest is one of the best things to do when sickness or infection invade your body. Also, many studies have linked antioxidants and melatonin to help fighting heart disease and cancers as well. Ensuring optimal melatonin production and good sleep habits at an early age will help support a strong immune system and healthy development as you grow. Instilling healthy sleep habits at a young age not only improves overall wellness in your child, it encourages growth as your children mature. These habits can help prevent stress and keep sleep disorders at bay. Being well-rested and having healthy levels of melatonin will not only keep your body strong but will have a direct impact on anxiety and mental health too. Blue-blocking glasses, filters and light bulbs will prevent blue light from hindering your circadian cycle and your children’s by keeping melatonin levels regulated and keeping immunities strong.